Woohoo!! Daddy is driving! Daddy is going up and down steps! Daddy is starting his therapy! We had a great day meeting the therapy crew. They are so kind and was so encouraging to Larry! What a blessing to bring us to such a special place to get His body and heart back in shape! Now I do have to say we did go off the “No Salt, No Sodium, No Taste Diet” on Easter. Yes, it’s true we had honey bake ham and potato salad and my famous broccoli casserole! It was so good and the next day we started our oatmeal and hot tea breakfast! You know we can’t have caffeine! Well we tried that other stuff but the kick just isn’t there so now we have started drinking decaf tea! Larry continues to get up and 4:00 and do his Bible Study and prayer time. It is so nice now that he can sleep upstairs and I don’t have to sleep on the blowed up mattress in the front room. We have learned a lot through this experience. We learned that God wants us definitely to go back to Haiti and that He is not finished with us on the mission field. We know that God is showing us that our Haitian leaders are quite capable of keeping on without us. We have seen family and friends that we have not seen for so long. This has also been a great blessing for us. God is so good! He keeps showing us daily His love and we are so thankful for all the love you folks have shown us. It don’t get any better than that! Now about this no salt, no sodium, no taste food we are eating. Tonight I fixed mashed potatoes with Mrs. Dash and I Can’t Believe It’s Not Butter! Well when Larry took his first bite he said he couldn’t believe these were mashed potatoes! Breakfast isn’t too bad because we both love oatmeal. I went to the health store today. Things are so much higher when you try to eat healthy. I keep thinking, “what will we eat in Haiti?” The canned goods we have lived on have tons of sodium. I don’t think GOAT is a white meat either??? Larry so loves getting his cards. I have them hung on clotheslines throughout the front room. Every time he walks around the room it gives him so much encouragement. We feel your prayers and we feel your love. Just a bit of trivia before I end this. We had Granny Littrell’s bed moved to the first floor as Larry can’t climb steps yet. This is the same bed I would lift my Granny’s legs up in to get her in bed some fifty years ago. She had so much fluid that the doctor said each leg weighed about fifteen pounds. Now I am lifting my husband’s legs up to put him in this same bed! I am sitting here on the couch while my “Baby Love” is in the chair with about 10 pillows and a heating pad. Jody comes in the evening and does the night shift. I do the day shift and Lori comes down with all the “Heart Healthy” foods for us! She is here today making her version of “heart healthy chili”! She has made her daddy two different kinds of “Heart Healthy” cookies and they really aren’t too bad. Larry does pretty good in the day time. He has been outside walking today and admiring our beautiful spring flowers and bushes. We hope to soon have him sitting on the porch in a comfortable chair. He has always loved the spring time in Kentucky. 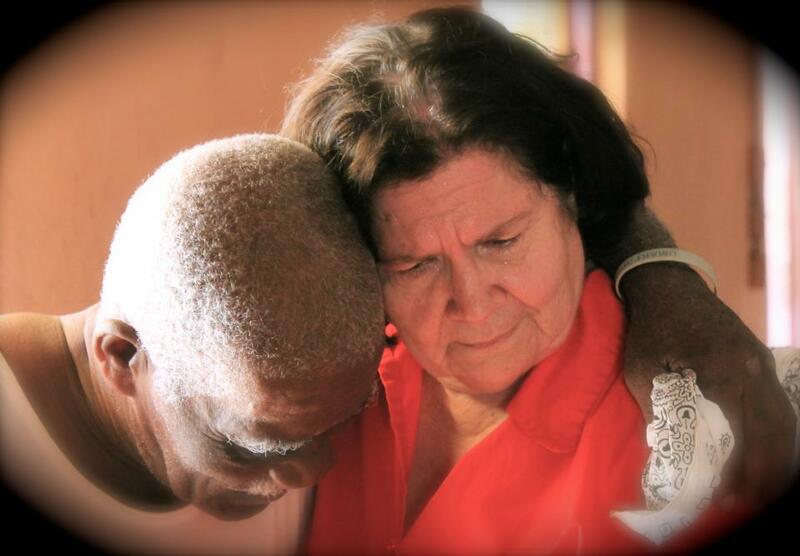 Our precious family in Haiti have come together every morning for a prayer meeting for Larry and me. I talked to Handson today and the people have been so faithful at the church. There is a new Spirit and this week they are doing a special offering. Each one brings what they have which is mostly food. Then they will cook it and feed the prisoners for one day. The leadership at the church is amazing. They continue to work as a team along with the congregation to serve the Master. I love to hear Handson’s voice. When he talked to Daddy today he was so excited. He was so happy to hear him as his voice was strong and he told the people, I am getting all fixed up so we can build our church on the mountain! Dad is out of surgery! We are so excited to report that Dad is out of surgery and doing great! We haven’t seen him yet but feel confident of the Lord’s healing. They did not have to syop his heart for th surgery. Please pray that he senses the Lord’s presence as he begins to wake up all hooked up! We will update as he progresses! God is good! Well it’s me again. I know You already know what’s going on. I don’t like it Lord. I don’t want to lose my Larry. I love him so much. I can’t imagine life without him. I also know that You want the best for us. That nothing happens that doesn’t go through Your hands first. You said You write our names in the palm of Your hand. So I expect Larry to be written on the palm of Your hands right now. You said we would never be alone and so I know You will be with Larry in the operating room and also with us who sit in the waiting room. Lord we need You so bad. Sometimes I think I am at the place were I just need the Holy Spirit to intercede for me because I can’t get the words out to tell You how my heart is feeling right now. So I trust You with every fiber of my being. I know You have given Larry and I so many blessings and You have answered so many prayers for us. Lord I thank You in advance of how we will be able to use this sickness to help others in the future. You know Lord we just want to shine all over Haiti! As Larry told You in the field walking to the river, he loves what he is doing. Thank You for allowing us to serve You in such a special way. Dad has at least a dozen blocks. He will need at least a triple bypass. Please pray for him and Momma. I will update as soon as we have specific times. On April 26 I will be (66) sixty-six. Over these 66 years I have come to believe there are no Supermen, only the Super Christ who took on human form to show us the way through the earthly maze called “Living for Him”. As I live in this fast lane for Jesus, I am now finding that I am struggling physically and am daily looking for Christ to give me strength. I have gone from serious back pain to a little pain over the heart. Before going back to Haiti at Christmas I had an epidural to relieve my back pain. Now a week from today I am having a heart cath. How do I feel about that? I think of it like my little old four cylinder mission truck in Haiti. It is a good truck, but it’s looking old and very much banged up; yet I get in it most everyday and it still purrs like a kitten. One day I was sitting beside the road with a broken ball joint. The other day I went down to get in it and there she sat with a flat tire. I said to myself, “Thank you Jesus it didn’t happen out on the muddy road to St. Louis-du-nord”. So now this heart problem, well thank God it didn’t happen on the muddy road to St. Louis-du-nord! My next journey seems to be a trip by St. Joseph Hospital to get a stint or two before I can be on my way. Now when you pass me in my very much banged up little truck in Haiti you will know there is a very much banged up little fellow inside. But don’t be fooled, we both are pushing through the darkness and into the Light. We are bouncing down victory road at 66, doing about 5 miles an hour! Now look at the pictures and see what I mean by victory road. This past year, completed February 20, the biggest building I ever built in my life. It is four stories high with connecting walk ways on 3rd and 4th floors to surgery units and a dorm area. I baptized four more individuals before I left Haiti last week. One of them had to be the oldest person I had every baptized. I left my little truck at the river and crossed over on foot, then walked three miles to a youth retreat we sponsored during Mardi Gras. Fifty-one teenagers from Twa Rivye camped out for three days. What an awesome time! These kids have grown so much in the last three years. You would be so proud of them. It was on this journey I realized I needed to get the tires on the truck checked and my heart too. I could go on and on but you see the pictures. So until I give you another shout, know in your heart that everyday me and my old truck will be going about five miles an hour down victory road, pretty much banged up but your prayers and support keep the gas in our tanks on full! This is the song I sang to my nephew in the Intensive Care Room at the Tampa Hospital. He still is on the breathing machine, his lungs continue to fill up, and his kidneys are not working as well as they could be–but I believe with all my heart that God will heal him. I so enjoyed my stay at my brother’s house. We cried together alot but we also shared some laughter. We talked about the good old days with my Momma and Granny. My brother had slipped away from the Lord for a few years but let me tell you he is back serving the Lord and even teaching a Bible Study. I went with him to church and he has the most loving congregation. They were so friendly. They have been so good to my brother Bobby and his wife, Carol. When I got on the plane to go home, we all cried. Now I am in Kentucky with Larry. We have a few speaking engagements before we go back for Easter in Haiti. 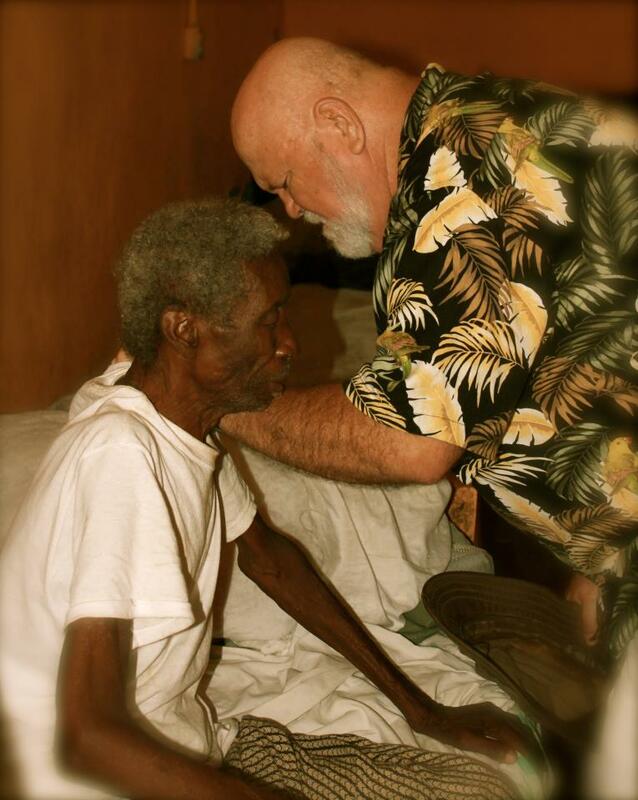 The Lord has really blessed the church in Haiti. Larry baptized Mr. Nussiance who must be the oldest man in our area. He also baptized Patrick. The people in the used to tell us that he was crazy and leave him alone. Well the Lord gave me a special love for Patrick. He was not crazy but just needed someone to care! Don’t we all? Please continue to pray for my nephew and of course my precious family at Twa Rivya. I am convinced that God is all about family. Relationships are so important. They were important to Jesus and of course God wants to have a personal relationship with us. I heard a great sermon the other day on prayer and one of the things this preacher shared was the closeness you feel when you are on your knees praying to the Father and taking time to listen to Him. Praise God for family! Thank Him for Family! And if you need to get peace with your family, do it now!!! I am in Tampa Florida at the St. Joseph hospital with my Brother Bobby. His son, my nephew, had a massive heart attack and even was brought back to life in the ambulance. They have called all the family in as he of course was and still is in critical conditions. This little boy who is now 46 years old is my pride and joy. When I was a teenager I would babysit him. I would dress him up in a little sailor suit and cute little hat and off we would go in the stroller to downtown Versailles. I would take him to the Five and Dime Store and everyone would say “Well he is the cutest thing”! He had dark hair and the most beautiful eyelashes. He still does. He is struggling so much with his breathing now. When I went to see him in ICU he kissed my hand and said he loved me. I pray over him every time I go back to see him. It is so difficult for the family to see him hurting so bad. I am so thankful he is off life support but if his breathing doesn’t get better, they said they may have to put it back on. He has a long ways to go but I know the Lord is holding him in the palm of his Hand. He said that He writes our names on the palm of His Hand and so I know Bobby Baker is printed on my Father’s hands. Please keep my nephew in your prayers. They don’t want us now to go in and see him because he gets too upset wanting to talk to us. I feel like he is not only hurting so bad but is afraid as well. You know I thank God for the hospital and the machines he is on. If a Haitian had this happen he would not have any of these things to keep him alive. Thank you Lord for all the blessings! Well folks this is the first time I have had electricity long enough to give a shout out to ya! The water tank has a crack in it so we have had no water!! There has not been much rain so the water level is really low. I knew things were getting bad here when I got up yesterday went to the bathroom and looked down on the floor and there was a Geico looking up at me. We both just kind of stared at each other. I really thought he was going to start talking and try to sell me some insurance! At any rate, when I moved he did too and I guess he still is in my Guest Bed Room!! As you probably know my Jody Beth was very sick in the Miami Hospital. She is on her way back to her family tomorrow but it was a very scary situation and even thou I will not go through all the details she had some life threating bloodclots. Once again my Lord did a miracle. Someone emailed Jody last night and said they were going to call her Miss Kitty cause she has nine lives! The days seem endless with people coming that need help. To some I say yes, to others I say no. I hope I am making wise decisions because I know I am representing Jesus. Larry and I have felt such an oppression these past few days. I have been reading a lot in the Old Testament and you know God got really upset and when you read his punishment to those who went to idol worshiping– it ain’t good!! I think we hear and see horrible things on television but let me tell you there was some wicked stuff back in those days too. We have to realize that God doesn’t play. He means what He says. I feel more compelled than ever to let people know that God is a jealous God. God will not tolerate you serving another Master. This voodoo stuff is nothing to play around with and I do not feel that most Haitians really think they are going to a bad place if they don’t serve the Lord. I really believe they are living from day to day and whatever means they can use to get some food on the table or the rent paid they will pursue. We must be bold in our teaching and preaching that there is a Heaven and there is a Hell and they are not going to Miami when they die! And that’s all I got to say about that! !